A bit late to the party, but me and my friend also booked two seats in cart 349(seat 52,58)! Does anybody know when it is possible to buy the actual train tickets? It seems that 349 is fully booked by PJ fans! I think that we will be able to buy the tickets in Prague at the train station. I'm in Car 349 also, with the wife. Seats 105 and 96 (I think). Apologies if this has been brought up earlier, but do we know when Krakow to Berlin train tickets will become available? If I am looking at the seating chart right you guys are back to back. Maybe good for some couples but I am assuming you are looking to sit together? Where did you find the seating map? ^^^95 and 97 is me and Deftones!! I wish this PJ fan was on that train. Sitting across from me! Brilliant. I see 93 waiting for you! Are you on Facebook? I will walk you though it if you want. Yeah, i do have a Fakebook account, which i rarely go on. Booked the overnight train 10:19 on 7/2 getting in at 638am on the 3rd (Prague to Krakow). there are 4 of us so we booked two sleeping cars w showers, we used RailEurope.com and actually called the company - they are mailing tickets to us. Not sure if anyone else did or is going to do this but seems speaking to a human and getting a ticket order # with delivery will put the mind as ease if going this route considering so many different aspects of this are in the air. Hey, I booked this direct and have my eticket to print. I think you do pay more through an agent, thats the only thing. I used Czech-transport and managed to get 2 2nd class tickets for 2nd July at 10.24. They are supposed to be being delivered on Monday! We shall wait and see! I’m a little nervous!! I'm a little nervous about that website too, and that's why i haven't ordered a ticket from them , yet. Were you able to Book your Seat? Can you give us a update if you get the ticket mailed to you or not? And, is the ticket being mailed in Europe? I will do. I have received a mail off DHL saying that they will be delivered tomorrow, so that is a good start. I asked for reserved, so hopefully I will have a seat. I have been in email contact with them quite a lot and they have been very good (I originally booked the wrong date! :-) and they were good about that. They don’t have any e-tickets left, so had to pay more for paper ticket and delivery as their office is a 40 minute walk from the train station and they only open 10-5 Monday to Friday! You still can make a reservation for a seat, for the 10.24 morning train to Krakow.. If anyone is still intrested can choose Connection&Ticket from cd.cz site and then you will be able to choose ''I want a reservation only'' for the 2nd of July 10.24 train. There still 10 seats or so available in carriage 349. When do you buy the ticket? On the day? We gonna take them when we arrive, at 30th.. Yes you can buy the ticket from an international ticket office from any of the main Prague train stations. Make sure you print your reservation. 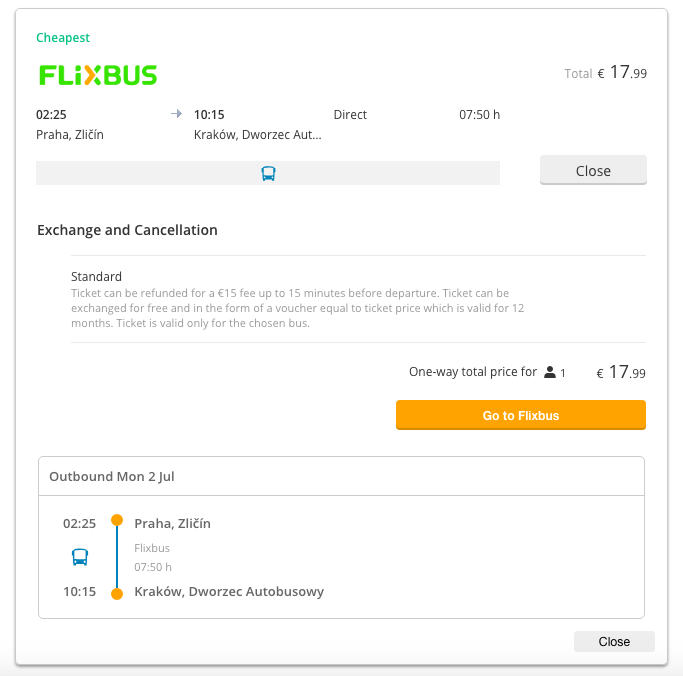 It looks like the night bus from Prague to Krakow is going to be available! 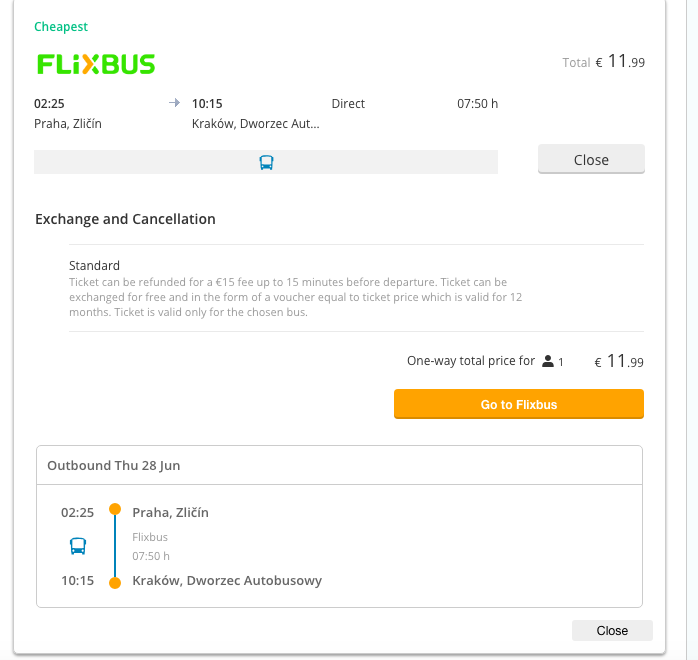 Flixbus just updated their site up to the end of June and they are still doing the night bus. We just now need to wait until they update for July. Anyone interested? Thinking it may even be possible to get to Auschwitz for the day with this time. Tickets finally arrived today, due to numerous conversations why DHL struggled to deliver them!! 10.24 Prague to Krakow from what I can understand it looks like we are coach 349 seats 65 & 67. FYI - I originally asked to pick them up at their office, which was €10 cheaper! However, I then found out that their office is only Monday to Friday and only opens at 10am. Their office is 40 mins away from the station, so I obviously had to email them to change it to delivered to UK seeing that my train is at 10.24! They had no e-tickets left when I tried! Awesome sent you a PM! Direct flight from Krakow to Berlin is down to 86 Euros! The direct day bus has gone up to 80 Euros per person! Just booked the night bus from Prague to Krakow. Anyone else interested? ^ We booked a night bus with Flixbus a few weeks back, but we leave at 23.30 on July 2nd and arrive at 07:40 on the day of the show. Hoping I can sleep on the bus! Very affordable. All of us on the train will be leaving Prague when you arrive in Krakow. I am worried as well but can operate on a small amount of sleep most of the time so we will see. Really hoping I can sleep on the plane ride over too. I get into Prague at 2:00am local time (7:00am Prague time) on the 1st and usually have issues sleeping on a plane. I figure after the show is done I will be so beat that I will just crash on the bus.